An Amber Alert was issued early Tuesday for a missing 10-year-old boy from Cadiz, Kentucky. Authorities said Isaih Boren lives with autism. NASHVILLE, Tenn. (WTVF) — The Federal Bureau of Investigation has confirmed that a missing Kentucky boy at the center of an AMBER Alert has been found safe. According to the National Center for Missing and Exploited Children, Isaih Boren was last seen Monday in Cadiz, Kentucky when he was allowed to leave home with a man named Isaac Chamberlain. 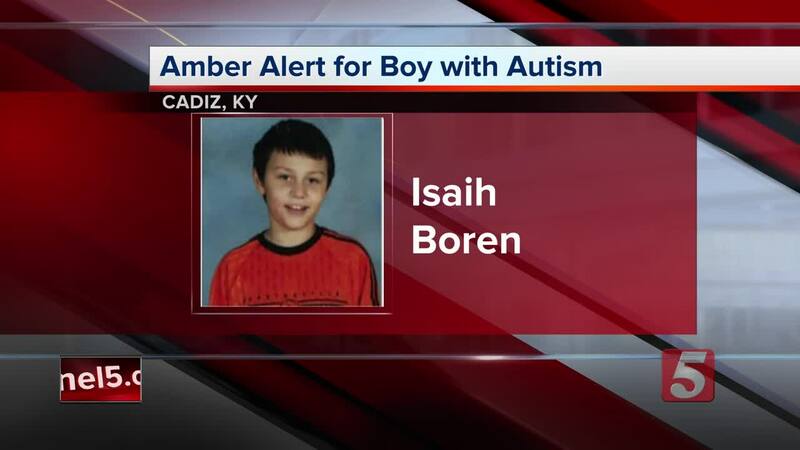 FBI Louisville and @kystatepolice are excited to report Isaih Boren has been found. Isaih is safe, and we thank everyone who gave great attention to this matter. The vehicle in which they had been traveling was later found but Boren and Chamberlain were still missing. Boren was later found safe in Hopkins County, just north of Christian County. It's unclear if Chamberlain was with him. Chamberlain was arrested on an unrelated theft warrant, but charges will be forthcoming. He was a family friend that was supposed to take the boy out for an errand on Saturday and return him. Cadiz Chief Chad Grace said they activated an Amber Alert overnight primarily due to the length of time Isaih had been missing.